Cut out the two trucks along the dotted lines. Tape them to each side of your Kidstir kit box (or a shoe box). Cut out the chili pepper decoration. Tape that to a third side of the box. Line the box with tissue or a paper towel. Fill with chips and salsa (recipe links). Order’s up! 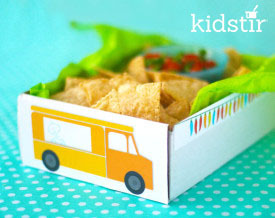 If you are a fan of this taco truck box decoration, we know you’ll love our Taco Truck Fun Kit.